A team of researchers at the Abertay University in Dundee, U.K. have created a cookie recipe made of cricket flour in hopes of attaining a more sustainable food source for the the world’s estimated population of nine billion people by 2050. In making the cookies, the research team used house crickets from Thailand that were finely-ground into flour. According to the experts, the flour contained about 1,100 crickets for every 100 grams. The research team also noted that the flour used was organic, Fairtrade, gluten-free and rich in protein. The researchers then used other traditional ingredients in baking the treat. The experts stressed that preconceived attitudes about food should change in order to meet the food demands of a growing global population. However, project supervisor Dr. Alberto Fiore of the Division of Food and Drink noted that the Western world’s reluctance about consuming insects would be a big challenge. 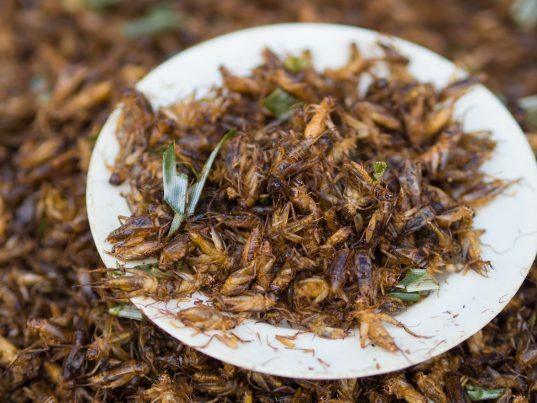 “Insects are a lot more sustainable than other sources of meat like, beef, chicken and pork. They use a lot less land and water and you can eat the whole insect, not just part of the animal. You may not want to eat a whole cricket, but if it’s hidden away in flour, or in a biscuit, you may be more likely to accept it. The flour is already for sale and there are a handful of companies that have started out in this market. The UK, the Netherlands and Belgium are more advanced in this area than the rest of Europe and it will take some time for this to grow. If we are seeking to feed nine billion people by 2050 then we have to change our eating behavior, as the amount of meat we eat is not sustainable. You have to make products look and taste really appealing to consumers to hold their interest,” lead researcher Anja Sieghartsleitner told The Daily Mail. Crickets are only one of the many edible insects that are found in North America. Most of these edible insects are significantly high in protein and low in fat, which may actually help people meet their daily nutritional needs. The Secrets of Survival website has listed 10 edible North American insects that can be readily consumed. Grasshoppers – Like crickets, grasshoppers are notably rich in calcium and protein, and may add an extra crunch on certain dishes. Caterpillars – The larvae of moths and butterflies are an excellent source of protein, niacin, and thiamine. June bugs – June bugs prove to be tasty snacks especially when grilled or cooked over fire. Locusts – Locusts, which describes a swarm of crickets or grasshoppers, are a diet staple in certain parts of the world. Ants – Boiling ants in may help eliminate the vinegar taste that they have. Mealworms – Mealworms are a staple food source for primitive cultures. Once cooked, they are said to taste like roasted seeds or nuts. Termites – Termites are also notably high in protein like caterpillars. Scorpions – Scorpions are said to taste best when they are grilled in a pan or roasted over fire. Bess and wasps – As with caterpillars, the larvae of both bees and wasps have become a staple in certain parts of the world. Centipedes – Centipedes are edible as long as the head and pinchers are cut off.